Lowrance Elite 5 CHIRP has an average rating of 3.25 out of 5 based on 8 user reviews. Lowrance Elite 5 CHIRP combines the best of sonar, GPS mapping and Downscan Imaging. Using CHIRP sonar technology, the Elite 5 has been equipped with the tools to make it extremely sensitive to locating fish while providing an improved target resolution and noise rejection, making it much easier to see bait fish and game fish targets. Using a high-resolution 5-inch color screen, the new Elite 5 makes it easier than ever to see what’s going on underwater. 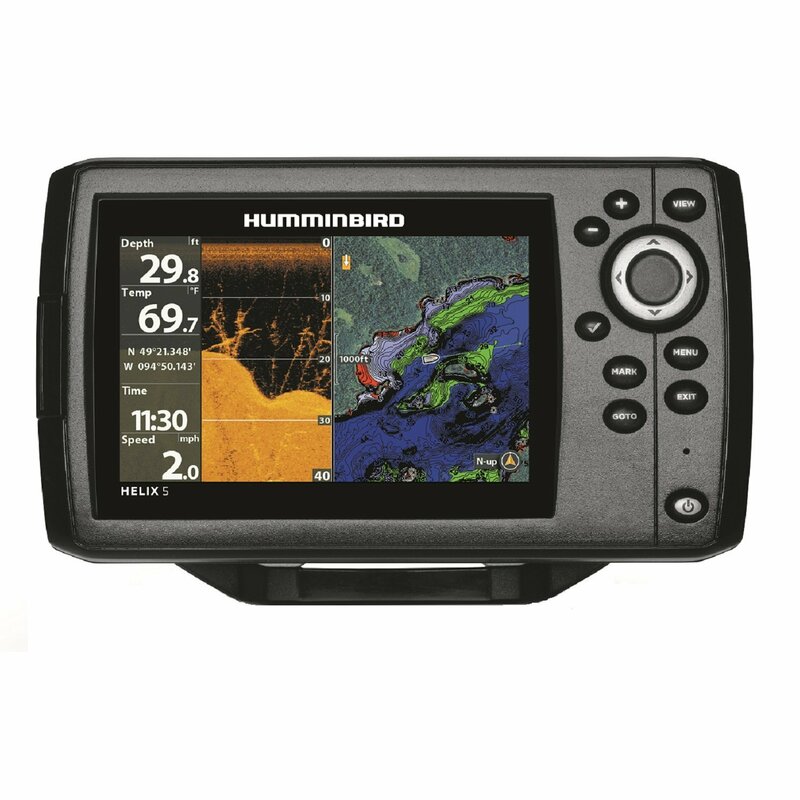 Providing better target identification at greater depths, fish can be marked clearly at faster boat speeds, which is a major advantage of this fishfinder. Multiple sonar settings can be viewed in one display, and the Downscan Imaging provides images so detailed, you will not have any problems identifying what’s below. Elite 5 CHIRP, just like it’s HDI predecessor, provides built-in maps of over 3,000 U.S. lakes, rivers and coastal contours up to 1,000 feet. Customized maps can be made using sonar data recorded with Insight Genesis, and Downscan Overlay technology allows you to lay Downscan Imaging onto CHIRP sonar, giving the clearest and most-detailed picture yet of the surface below. What makes this fishfinder stand out so much from others is the convenience it provides. Advanced Signal Processing minimizes manual adjusting of settings, while Trackback reviews recorded sonar history of structure and transitions, enabling fishermen to accurately pinpoint hotbeds of activity below the water’s surface. With its one-thumb use on the page selector menu and multi-window display for easy movement between page layouts, the Elite 5 CHIRP has set the standard for today’s modern anglers. You can get a great deal on Lowrance Elite 5 CHIRP here. This is a great fishfinder, shows lot of detail in the sonar mode and downscan mode. It also works very well at high speeds. My problem is with the GPS. The basemap in my area (Louisiana marsh) is useless and the Lake Insight Pro is not much better. I had to upgrade to the Navionics chip but even that is not as good as Garmin maps. Stay away from this unit if you need a good chartplotter. Using GPS on this unit is very frustrating. Waypoints that were marked on a lake are displayed on land. The whole waypoint system is really annoying, labeling and recalling waypoints is not very user-friendly. If you need a good GPS on your fishfinder, buy Garmin. Great imaging and fairly easy to use. I love gadgets and this is fun to play with. This is my first chartplotter/fish finder, so I don’t have anything to compare it to but it works very well for me. Especially with the firmware update and external gps antenna a navionics gold chip. Amazon for $499 with 200/50 400/800 transducer. I finally decided to replace the 20 year old Eagle fish finder I have been using forever. I know technology has improved a lot in 20 years, but the Lowrance really impressed me even so. I went with the Elite 5 because it gave me all the latest imaging technology without the extra expense for the bells and whistles on the 7. The only thing I would tell Lowrance to improve is their advertising of included accessories. With so many different packages available just on the Elite 5 it is not entirely clear what you are getting in the box. I ended up purchasing a speed wheel and temperature sensor separately for $100. Other than that this thing has been great so far. I called Lowrance a couple times with questions during the setup and configuration, and support was very patient and walked me through everything step-by-step. Their support staff are friendly and fully understand the products they sell. The imaging is amazing. It shows more detail under the boat than I thought possible from a fishing sonar. This unit was the perfect fit for my 16 foot Lund. Barring some horrible malfunction or accident, I expect this one will keep me on the fish for another 20+ years. I advise any angler looking for a fish finder to try the Elite 5 or one of Lowrance’s Elite series models. Very disappointed… glitches alot and if I reset it several times, it might start working again. I get lots of fuzzy readings, false shallow water alarms, Im not sure If I just got a bad unit but my old 100 dollar hummingbird worked more consistently than the 5 chirp. Fantastic unit for the price. With that $100 off until Aug/2 it makes it very hard to recommend another unit. Very user friendly, Nav+ included ($200 value), solid warranty, quality CHIRP sonar and decent GPS. Overall I think that there are better units on the market but not at the same price. Highly recommended. I am a crappie fisherman and really like the chirp feature on this fish-finder. It really shows the fish well on the clutter free screen. I can even see my jig and know when I`m at the right dept. This unit is not user friendly, it`s hard to move around the menu opposed to my old humminbird. I don`t like the gps. You have to be going above .07 mph for it to show direction of travel. Just bought the 5x elite chirp I’m happy with the screen but wanted to install it with the flush mount. I used the instructions and the mounting kit that came with it and 3 out of the 4 corners broke off. I call and told them what happened and was told it was my fault and they can’t do anything. Asked if they would sell me a new back plate and was told they don’t sell parts for them. So no help unless I buy a new one. Not happy with that, not my first time putting new electronic on my boat.